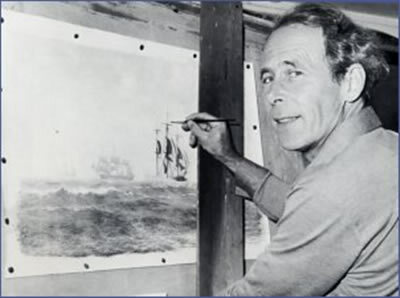 By the time he died in 1984, John Chancellor had been painting full-time for only fourteen years. 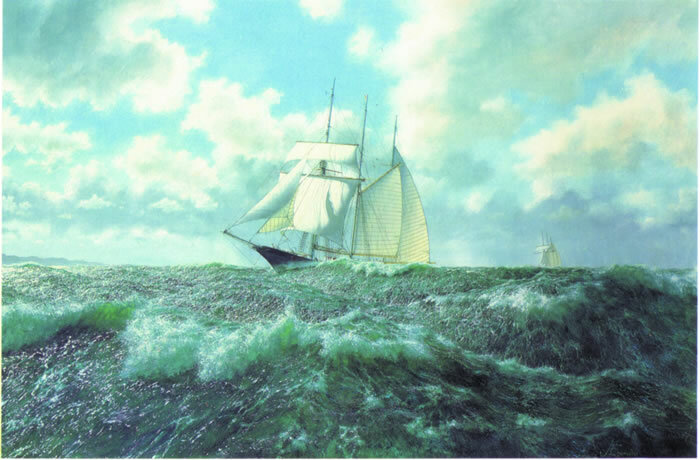 He had completed seventy oils and a similar number of watercolours and one might think this was insufficient number to establish him as one of our great sea painters. But quality rather than quantity has proved otherwise and John Chancellor is now recognised as a major talent. The publication of two superbly illustrated books by David & Charles and this series of limited edition prints, have added to the ever increasing circle of enthusiastic Chancellor collectors. Many are professional or amateur sea-goers who have no difficulty in identifying the special details which reveal that the paintings can only be the work of a fellow seaman. Others who have never been to sea can discern that here was a man who knew his subject intimately and painted it with passion. Born in Portugal the son of a British Anglo-Latin Lawyer, John’s earliest memory was seeing the ‘Grand Bankers’ setting off for the Newfoundland and Greenland fishing banks. He showed a remarkable talent for drawing as a child and spent a brief period in his adult life as a commercial artist. When war broke out he joined the merchant navy and survived two torpedo attacks. 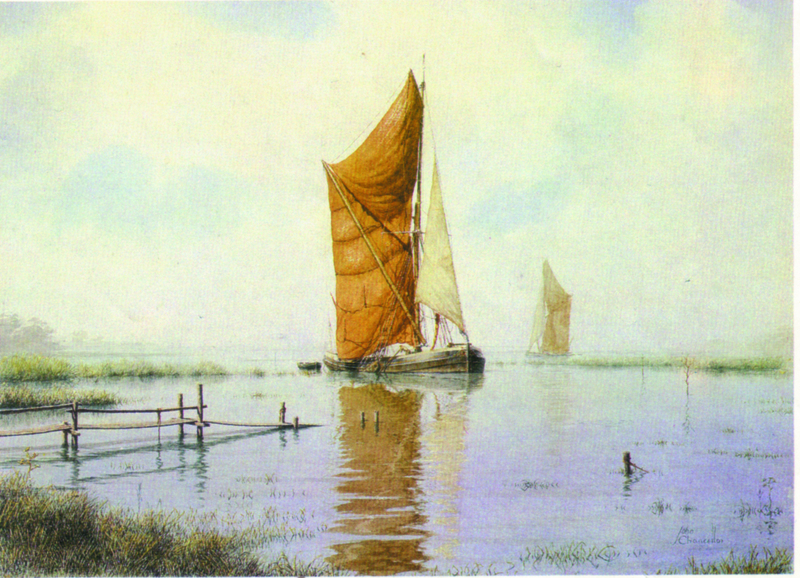 Later, in peacetime, he served on deep sea tankers, was master of coastal barges, owned his own fishing craft and then developed an innovative hydrographical survey boat, ‘Exact’, converted from a fishing boat. 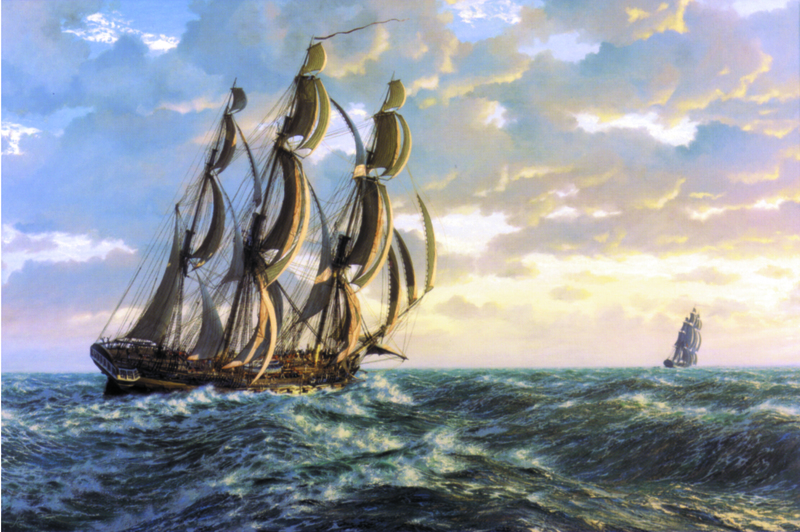 In 1970, still chartering ‘Exact’ with himself as coxswain, John painted between commissions and it was during this time that he created the oil painting of the sail training ships Sir Winston Churchill and Malcolm Miller. The immediate interest in this painting and the enthusiastic commitment of Triton Gallery in Torquay, Devon, persuaded him to give up the sea and develop his talents as a full-time artist. Chancellor’s paintings are widely acknowledged as being ‘so detailed and accurate they are without doubt historic documents in their own right’. 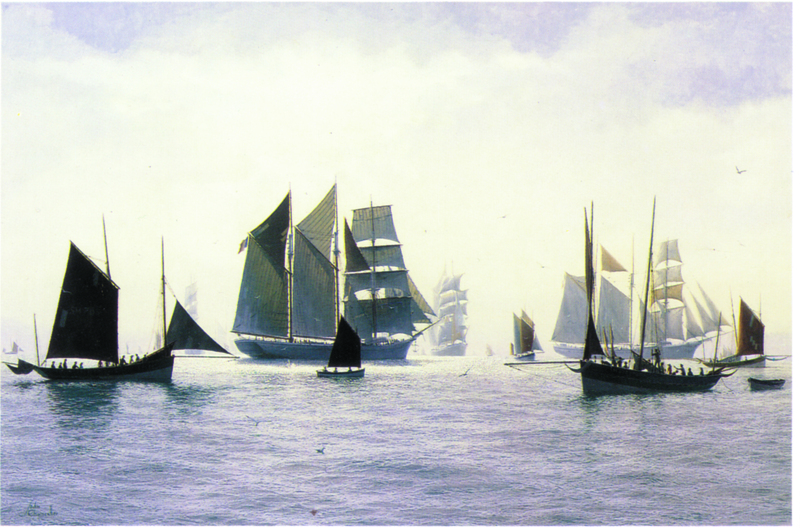 Despite his detailed accuracy in the portrayal of sailing craft, Chancellor’s paintings are much more than mere illustration. From the awesome power of the elements in ‘Perfect Hurricane’ to the delicate wistful atmosphere of ‘Day of the Men’, Chancellor treats us to a masterful seaman’s eye view of the sea and ships and takes us far beyond the merely photographic. 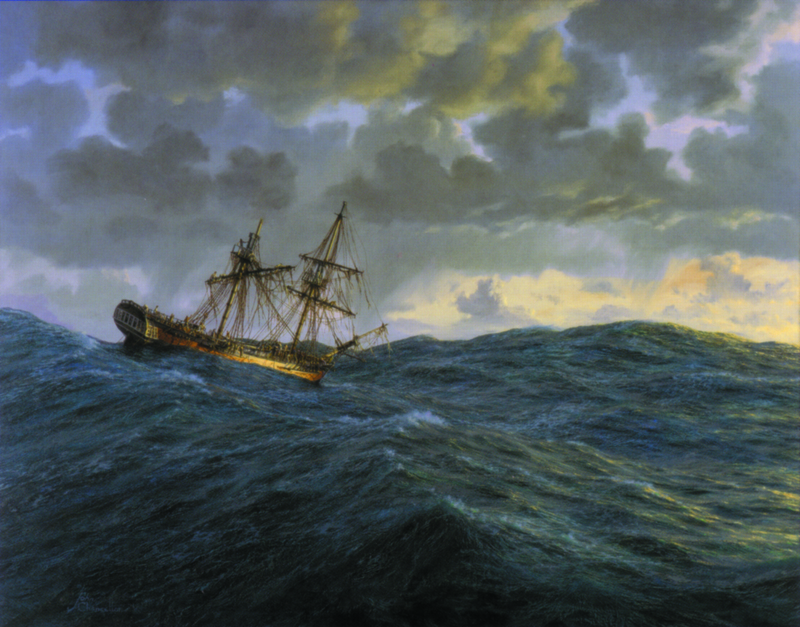 Chancellor often commented on “the contrast between the tight, detailed painting necessary to satisfy his ‘neurosis for accuracy’ in portraying a vessel and the need for free impressionist techniques, to convey the mass and movement, the surface and the translucence of a sea. The sea is, after all, a constantly moving subject with great distances and perspectives in play”. 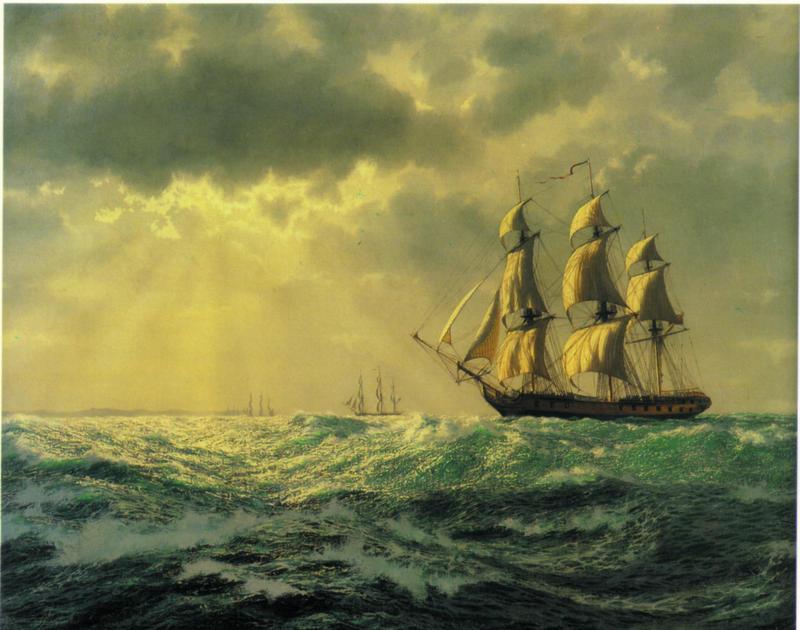 He adhered to the principle that “the sea and sky are fundamental, the vessels being intruders in a natural setting largely unaltered by their presence”.Thirty years of seagoing provided the knowledge and experience vital for a convincing portrayal of oceanic and coastal conditions. At the easel Chancellor tackled the challenge of recording his close observations by developing a range of very diverse techniques to portray the conditions he wanted. His resultant paintings clearly bare the Chancellor hallmark and succeeded in achieving the movement he wished to depict. 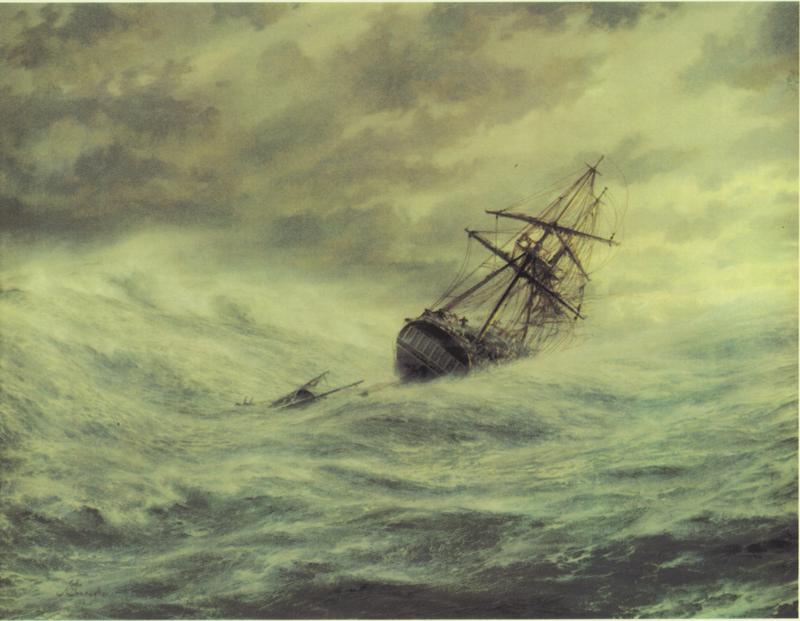 Chancellor was not a typical sea and ships man – he shunned the cliché subjects like mudscapes, clipper ships under full sail and the Battle of Trafalgar. 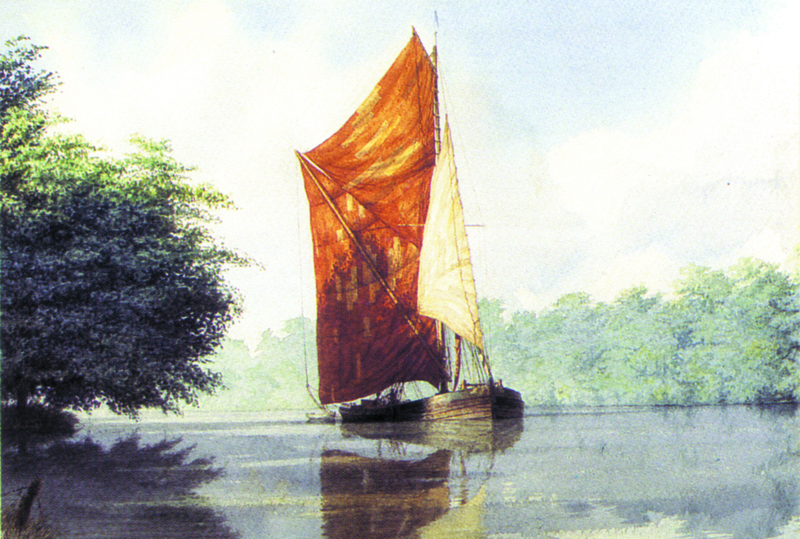 He was always prepared to forego the easy option in favour of subjects that stretched him and required a punishing degree of time on research and the need to develop techniques at the easel for weather situations he had not previously tackled. 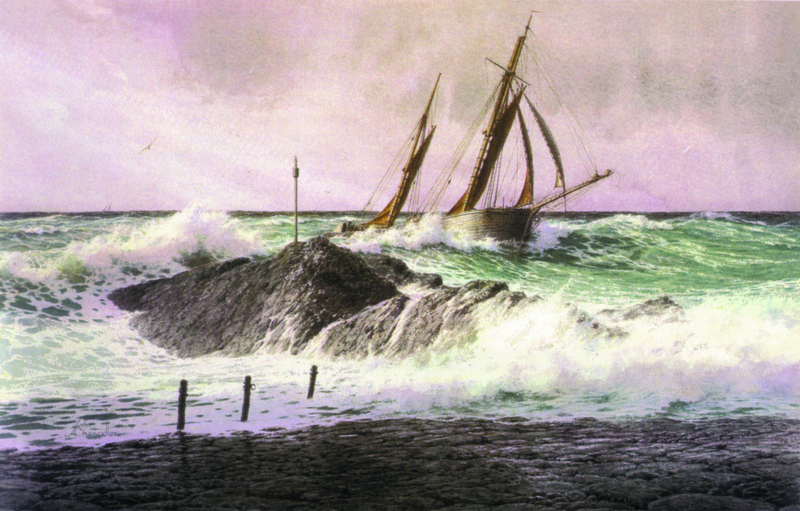 He poured hundreds of hours into researching sea situations which interested him and took a particular joy in chronicling what he termed ‘the unsung heroes’, the small unglamorous barges, brigs and schooners. 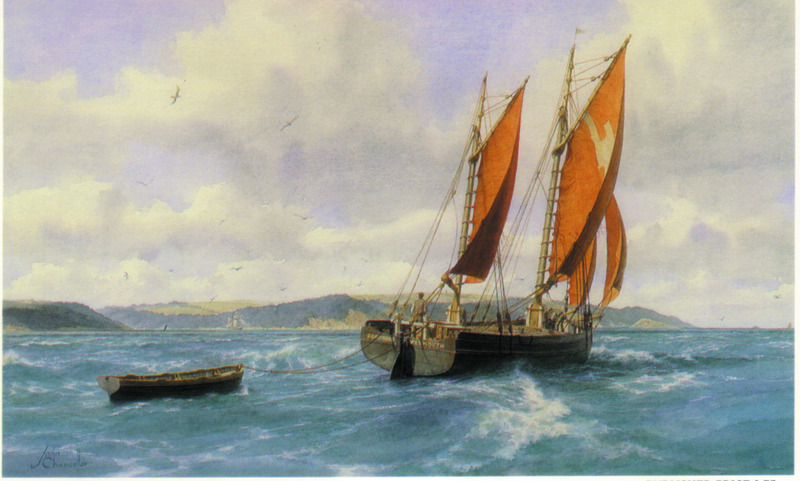 Often commercial considerations determined these vessels were tightly manned by a small crew of skilled seamen who spent a lifetime at sea without ever getting into difficulties, owing to seamanship skills which they took for granted. Even his definitive and now widely known painting of ‘H.M.S. 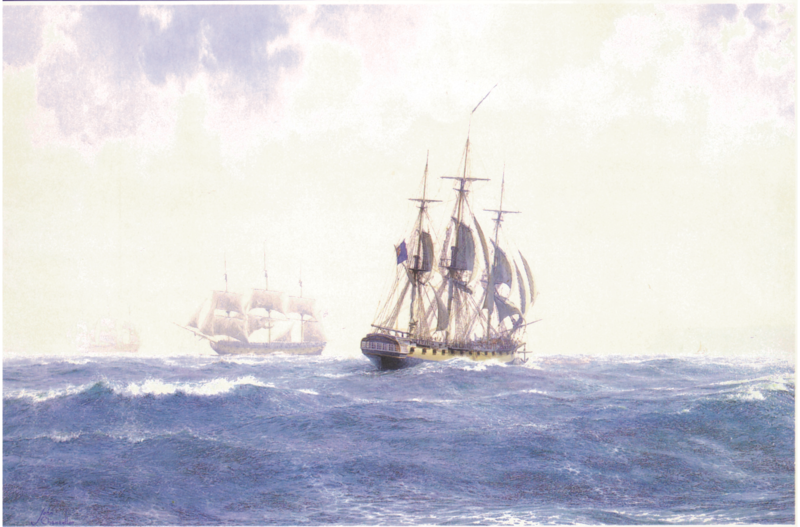 Victory’ was not a set piece battle but a poignant moment from a little-known entry in the Captain’s log. Although the catalogue of Chancellor paintings is small, it has the originality, conviction and scope to ensure that he will always be regarded as a significant contributor to the maritime history of both Britain and France. 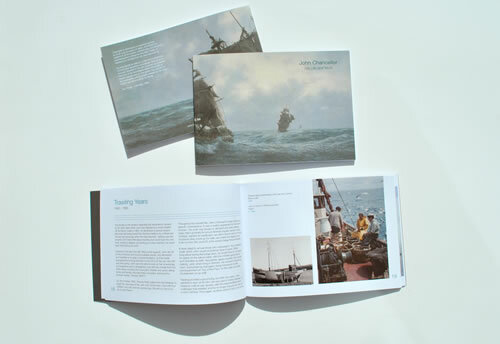 But above all, it is a collection with the distinction of belonging to the last generation of maritime artists who could claim direct experience of sailing craft in day-to-day use for commerce.